Earlier in August, ALICE experiment published a precise measurement of the difference between ratios of the mass and electric charge of light nuclei and antinuclei produced during heavy-ion collisions at the LHC. The article published in the journal Nature Physics confirms Charge-Parity-Time (CPT) one of the fundamental symmetries found in nature; known as CPT. A few days ago, the Baryon Antibaryon Symmetry Experiment (BASE) had also published a paper in Nature on the 12th of August, confirming the CP symmetry between matter and antimatter by observing oscillations of protons and antiprotons in a magnetic field and finding no difference. This symmetry of nature implies that all of the laws of physics are the same under the simultaneous reversal of charges (charge conjugation C), reflection of spatial coordinates (parity transformation P) and time inversion (T). The fundamental forces that we know should be the same when applied to an antiparticle, traversing in a mirrored space backward instead of forward in time. 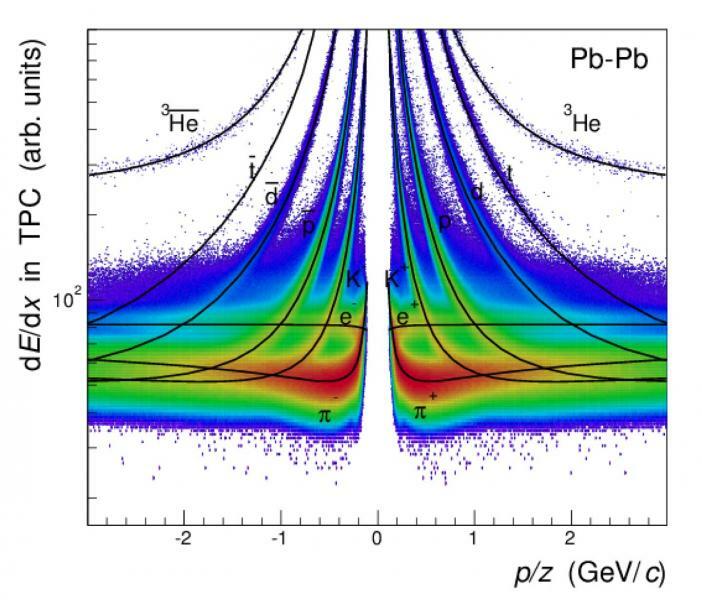 The ALICE collaboration has measured the difference between mass-to-charge ratios for deuterons (a proton, or hydrogen nucleus, with an additional neutron) and antideuterons, as well as for helium-3 nuclei (two protons plus a neutron) and antihelium-3 nuclei. Measurements at CERN, most recently by the BASE experiment, have already compared the same properties of protons and antiprotons to high precision. The study by ALICE takes this research further as it probes the possibility of subtle differences between the way that protons and neutrons bind together in nuclei compared with how their antiparticle counterparts form antinuclei. The result, which comes exactly 50 years after the discovery of the antideuteron at CERN and in the United States, improves on existing measurements by a factor of 10-100. The measurement by ALICE compares the mass-to-charge ratios in deuterons/antideuterons and in helium-3/antihelium-3. The experiment makes precise measurements of the curvature of particle tracks in the detector’s magnetic field and of the particles’ time of flight, and uses this information to determine the mass-to-charge ratios for the nuclei and antinuclei. “The high precision of our time-of-flight detector, which determines the arrival time of particles and antiparticles with a resolution of 80 picoseconds, associated with the energy-loss measurement provided by our time-projection chamber, allows us to measure a clear signal for deuterons/antideuterons and helium-3/antihelium-3 over a wide range of momentum”, says ALICE spokesperson Paolo Giubellino. The BASE experiment reported the most precise comparison of the charge-to-mass ratio of the proton to that of its antimatter equivalent, the antiproton. The charge-to-mass ratio — an important property of particles — can be measured by observing the oscillation of a particle in a magnetic field. The new result shows no difference between the proton and the antiproton, with a four-fold improvement in the energy resolution compared with previous measurements. Research performed with antimatter particles has made amazing progress in the past few years allowing for measurements of very high precision level. The measured differences in the mass-to-charge ratios are compatible with zero within the estimated uncertainties, in agreement with expectations for CPT symmetry. They also add to the mystery of what might have happened after the Big Bang on antimatter and why matter prevailed if CPT is not violated. These measurements, as well as those that compare the protons with antiprotons, may further constrain theories that go beyond the existing Standard Model of particles and the forces through which they interact.